We receive messages from customers wanting to show us their latest creations fairly regularly. We are always thrilled by the variety and creativity of these projects, and we share a lot of them on Facebook. This one, we really got a kick out of, so we wanted to add it to our customer stories. I’ve re-posted the email we received from this proud father, as it tells the story best. Wanted to drop a note of thanks. My oldest son (7yrs old) is in Cub Scouts and last weekend we had our Troops Pinewood Derby races. We started to prepare about 2 months ago and my youngest son (almost 4yrs old) wanted to participate as well. 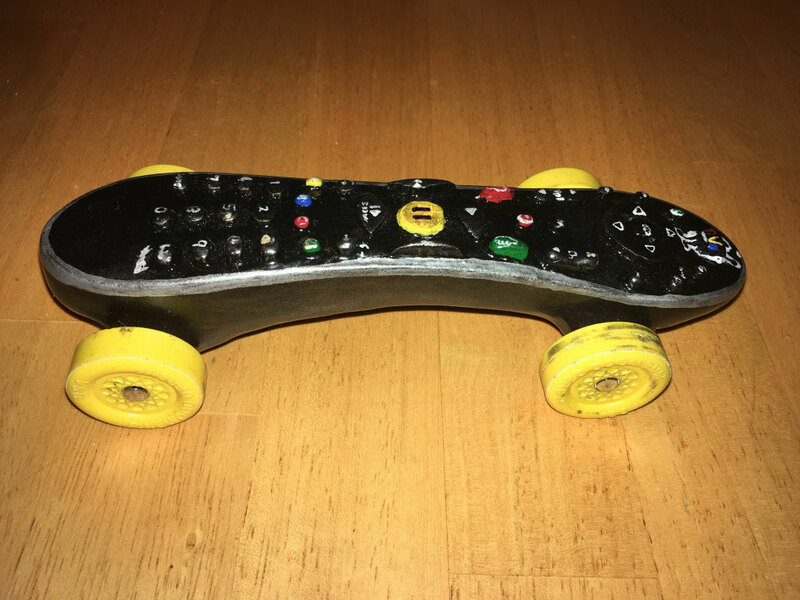 He was looking for ideas to design his car and found his design motivation from Tivo! We had the stock block of wood sitting on the kitchen counter while we discussed design ideas. It just so happened, nearby was one of our Tivo remotes. He LOVES our Tivo’s! 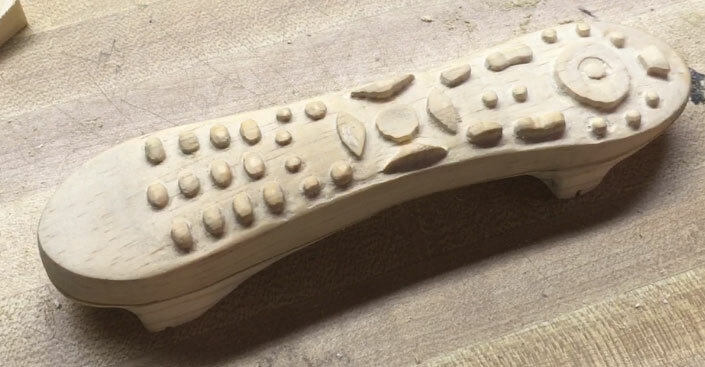 He quickly grabbed the remote and placed it next to the block of wood. Comparing them, he noticing they were similar in size and shape. 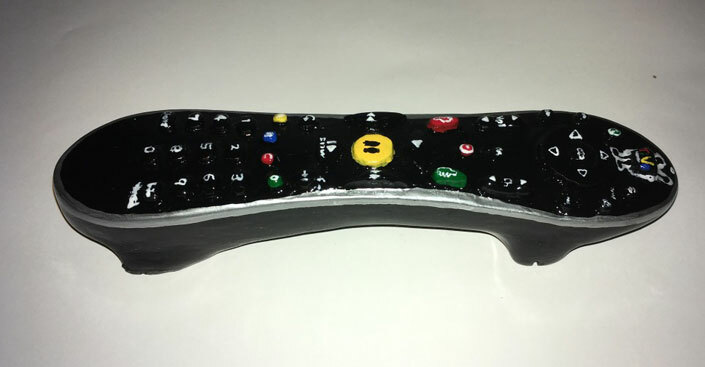 The gears started turning in his little thoughts and he then asked with great excitement and enthusiasm, could we carve his race car as a Tivo remote? That started our journey down a very interesting path… To make a long story short… We turned to the CarveWright. He setup the scanning bed and laid down the actual remote control. Scanned it. Then together we made a few corrections in the scan result, resized the design to the regulation requirements, and then he loaded the wood into the CarveWright and carved it to model the remote sitting on the counter that night. He then sanded his block of wood and painted it to match, with some help on the details and adult guidance of course. 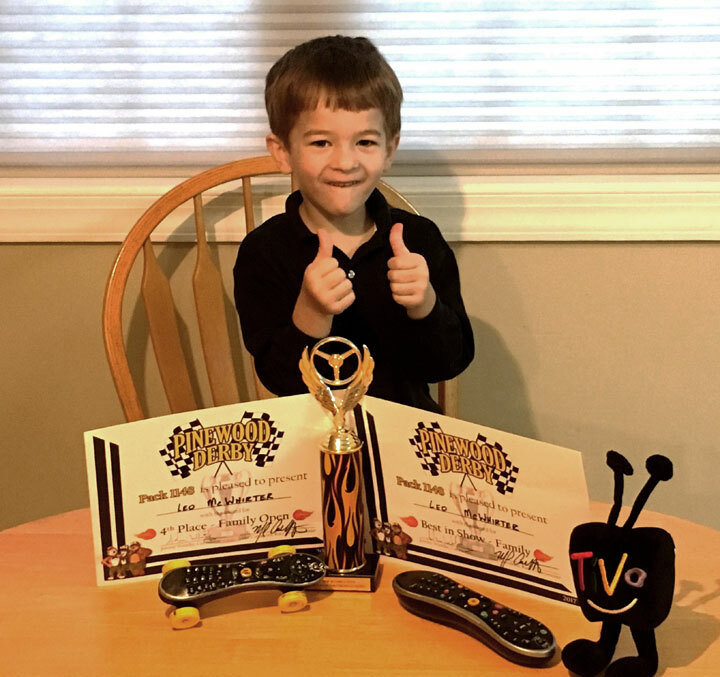 On Race day, this past weekend, the Tivo motivation, the CarveWright, and lots of hard work yielded a speed win in 4th Place, winning a certificate in his category and a 1st place win as Best in show trophy for the family open, voted on by all of the Troop scouts. This was his first ever Trophy and he is SUPER exited to have won it. He loves to show off his hard work. With that said, I write you to share a personal Thanks to CarveWright for the tools to make his vision a reality… We couldn’t of done it without the CarveWright. Pictures attached. Thanks for sharing, and congratulations on the trophy! That proud father is one of my fine sons and Leo is one of my fine grandsons! So grateful to CarveWright for enabling little Leo to accomplish his goal AND win a trophy! Nice work and great stuff..
What a great story! Wonderful imagination by the Cub Scout, too! Congratulations!